These are some more New York photographs from Sandra and Bob DeJessa. Johnny: " I remember Sandra, she was with her father Bob a lot. She was just a young girl at the time of these photos, i guess about eight or nine years old I think. Bob DeJessa was the band's driver and backline transport. He took alot of photographs. 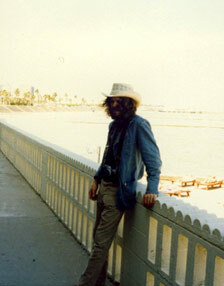 To the best of my recollection the photographs are from 1978/79." 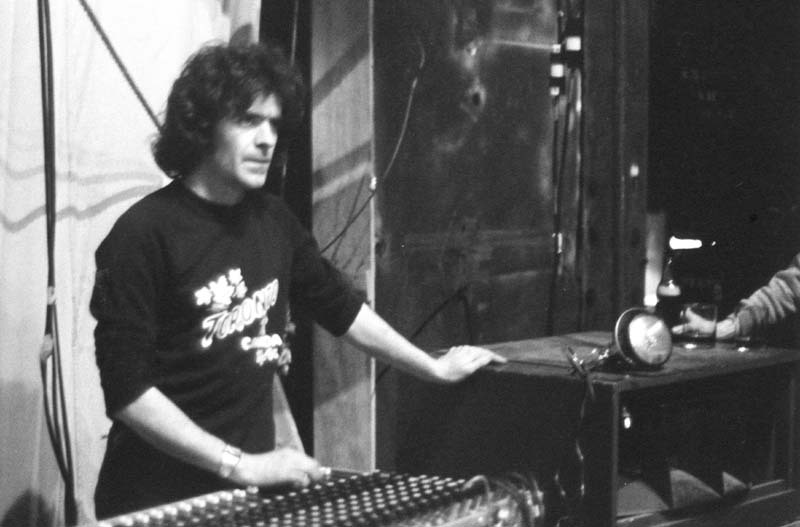 Pat Maguire, below was also part of the behind the scenes road/stage crew for Horslips on the same American tour. Pat and Steve Iredale rejoined the group in 2004 as stage crew for the Derry Gig. You can see Pat on Maurice Linanne's DVD "Return of the Dancehall Sweethearts". If you watch the DVD then Pat's the guy with the microphone at the front of the bus. 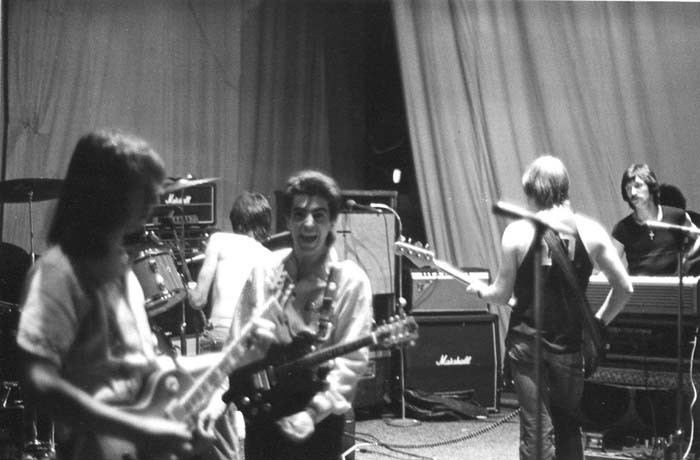 Johnny: " I think this shot was was taken during rehearsals in New York. 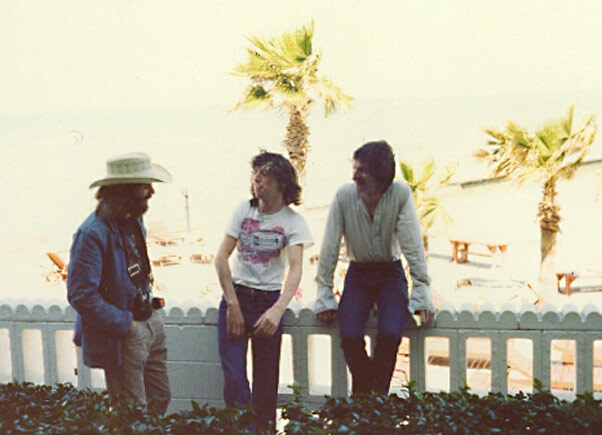 The Photo of Horslips below was possibly taken the same day. " Pat occasionally outs with Steve and Johnny when they gig. Left is a shot of Johnny with his Silvertone and that lipstick tube pickup. Note also the slide on his finger. You can find out more about the guitar on our instruments page. 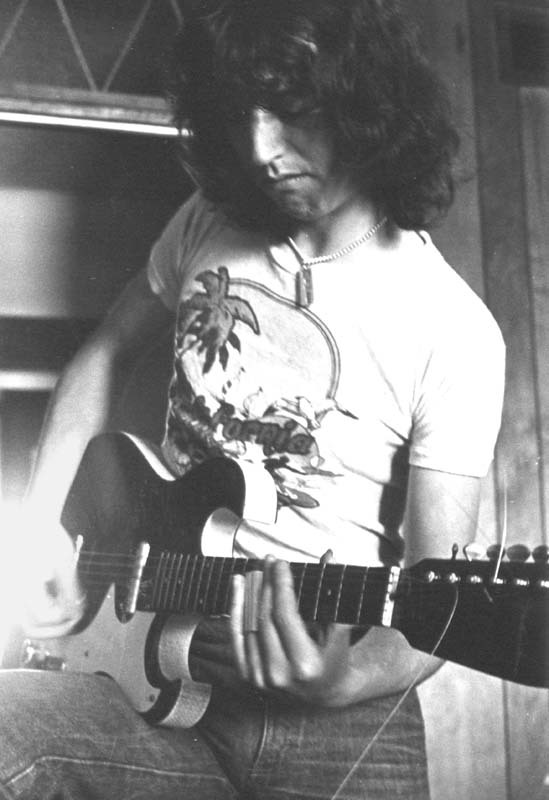 Johnny : "I'm not sure which' Motel' room the 'Silvertone' photo's were taken in, but I do remember I bought the 'Pignose' amp in a music shop in Chicago (home of the Blues!)." From the same day is another shot below. When you've finished looking at Johnny's boots have a look at the little Pignose amp on the desk. It's battery power unit in brown leather and Johnny still has it today. 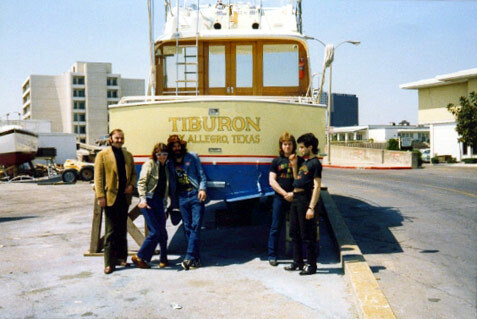 Johnny: " I used the 'Pignose' extensively on the recording of 'The Man who built America'. I had it connected up to my main rig, a Music Man 60 watt combo, (which incidentally used to belong to Tom Verlaine from 'Television'!) and a Marshall 4 by 12 cabinet. I used the Pignose as a pre-amp, to drive the Main Rig (and I mean DRIVE!). I think the whole rig can be seen on the 'Return Of Dancehall Sweethearts' DVD when I was filmed recording 'I'll Be Waiting' at Advision studios, London"
Another De Jessa shot here of Johnny with Horslips in the New York Heat. Sandra: " My father says he has a picture of me playing a guitar that the band gave me as a First Communion present in 1978." Lots of different New York dates at that time, including when Horslips headlined at the NY Palladium on a triple bill with Fotomaker and Van Halen. Moving from New York to Texas, here are more photographs. This time Bob is at the other end of the camera. The photographer is Eamon Carr who tells us:"These are from a set of very first snapshots I took with the camera (my first) that Bob DeJessa advised me to purchase. I still have it. Professional photographers tell me it has a great lens. When I bought it in the shop, the assistant threw in a couple of rolls of colour film. The first shot I took with the camera was in the shop. That's it on the left below. You can see my mentor Bob and the salesman!" On the right here: "There's a shot of Bob on the terrace outside the patio door of my hotel room. We stayed in a hotel by the beach." Eamon: "The one at the boat was taken when tour manager Alan McKenzie drove to the quay to book a fishing boat for the following day. Some of the band went shark-fishing but I stayed indoors!" Johnny: "That's Alan McKenzie in the jacket and there's me together with Bob. 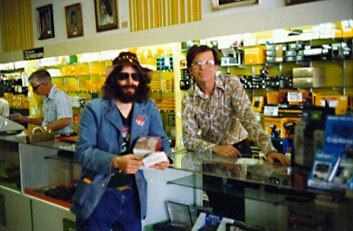 Charles is standing with our long time roadie Paul Verner." 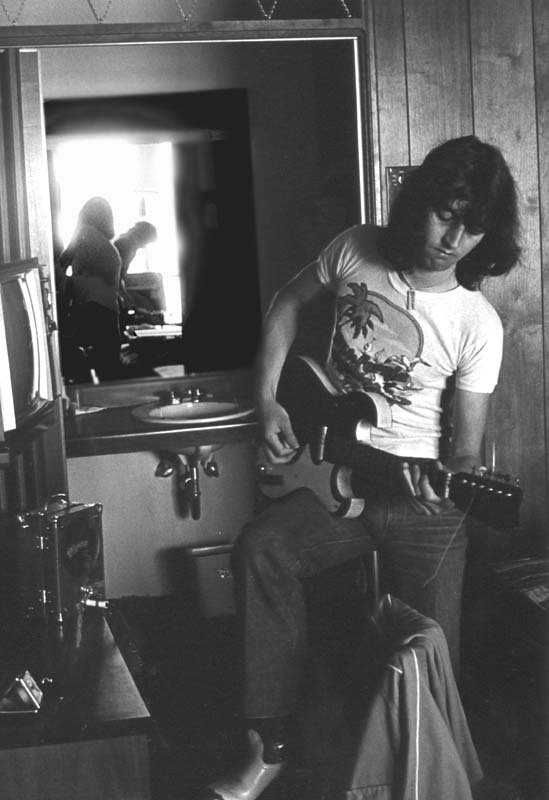 Eamon : " Finally, there's one of Bob with Johnny and Jim in more or less the same spot as the photo above. On the terrace outside the hotel"
March 28th Armadillo: World Headquaters, Austin. March 31st Dallas: Doctor Balls.